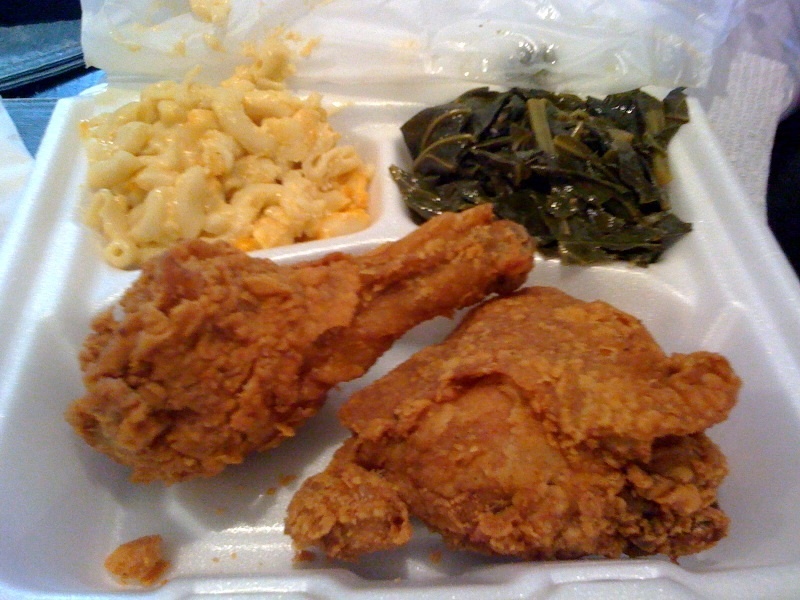 A two-piece chicken meal with macaroni and cheese and collard greens. For some, it’s about the race of the cook (I know plenty of people who think only blacks can cook soul food). For others, it’s the region of the dish’s origin — if it ain’t from the South, it ain’t got no soul. For me, it’s all about the taste. You’ll know soul food as soon as it hits your tongue. Soul food is the taste that makes you exclaim, “Somebody’s put their foot in this!” Soul food the traces of meat fat that flavor every vegetable on your plate. Soul food is the grease on your lips and the smile on your face. Franco’s Restaurant and Catering indeed fits the bill for genuine soul food. This descendent of the now-closed Jay’s Cafeteria in the West End provides food that comforts and fills empty bellies. You won’t find Franco’s in one of Louisville’s popular restaurant rows. Instead, you will need to venture to my neck of the woods — “Lively” Shively, specifically, Dixie Highway. Franco’s is the place you go to if you’re Southern, homesick or just needing food that will stick to your bones without emptying your wallet. The dinner menu reads like a Sunday post-church spread at grandma’s house: chicken and dressing ($7.14), beef shoulder roast with potatoes ($8.24), and meatloaf ($8.24), just to name a few. Then there are the types of dishes that only true Southern-food connoisseurs like my dad can enjoy, such as pig feet ($7.22) and baked ribs and kraut ($8.70). It’s hard to pick just one main dish and two sides when it’s time to order at Franco’s. All the food, from salisbury steak to macaroni to peach cobbler, is kept in warming dishes cafeteria-style behind a clear partition. About three employees are stationed at the counter to scoop food into to-go boxes or onto plates. When all that goodness is in front of you, it’s hard to narrow things down. Eventually, I settle on a two-piece fried chicken meal with macaroni and cheese and collard greens as my two sides ($7.14). The meal also came with your choice of a roll or cornbread (I choose a roll). I took the meal to-go, which was a bit of a shame because the chicken was cold by the time I made it to my mom’s house. I hope it was just the travel time, and not that the meat had been sitting out. But whatever the case, the fried chicken was simple, yet tasty. No frills or fuss. And the skin was audibly crunchy, a great trait in fried chicken. The sides were fantastic. The mac and cheese had that yellow-orange tint that I’ve seen on many a Sunday at my family’s kitchen table — there’s some cheese product in that dish, and I like it. The macaroni was creamy and cheesy and fantastic. As soon as I took a bite of the greens, I realized I should have bought a side of deviled eggs ($1.39), my favorite accompaniment to this vegetable. A splash of Frank’s Hot Sauce took the greens over the top. Franco’s is a bright spot in Shively and for the rest of the city, as well. The restaurant is great for the budget and even better for the need for some comforting soul food. The best fried chicken is cold anyway. I love day-after fried chicken, especially Lee’s or Popeyes. My name is Melissa and I own Downhome Cafeteria located at 2605 Rockford Lane, Louisville Kentucky 40216. Not sure if your still going to places and checking them out but I’d like to invite you to my place.